Based on a photograph of my grandfather's wharf in Spry Bay, Nova Scotia, Colloquialism combines the visual languages of naval code flags and the Settler-Indigenous treaty, the Two-Row wampum. Standing on the wharf and looking back towards Europe, the image reflects on my place in North America and my family's involvement in histories of colonialism and cultural amnesia. In this image, the wharf acts as a meeting place, where both the terms of the Two-Row wampum and an ensuing history of colonial violence are remembered in an unsettling hybrid. 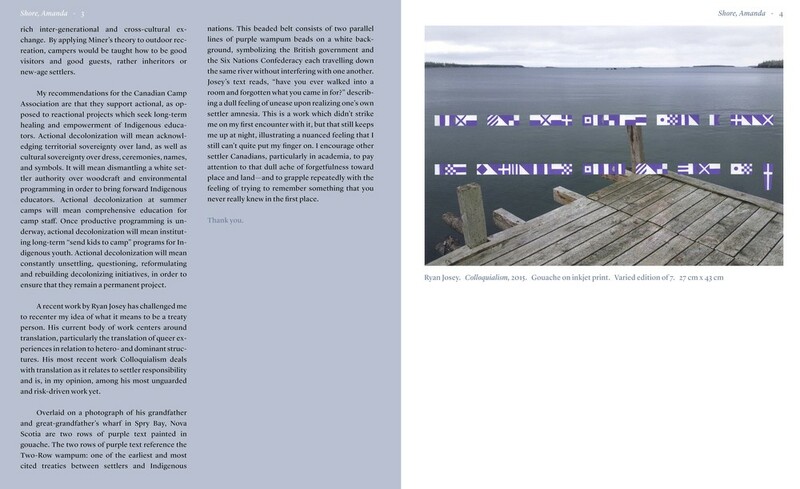 Translated, these two rows of encoded purple text ask: “have you ever walked into a room, and forgotten what you came in for?” Aligning an everyday experience of forgetfulness with the complex issue of societal amnesia, Colloquialism provokes questions about the contemporary coexistence of Settler and Indigenous nations and the importance of remembrance despite conflict and despite discomfort. Colloquialism, 2015. Installation views from Vorspiel exhibition. Image courtesy of the Anna Leonowens Gallery. Colloquialism was presented in research by Amanda Shore at King's College, Halifax, NS as part of SNARCon 2015. Amanda Shore is an arts professional based in Halifax, NS and Montreal, QC, whose research focuses on settler responsibility in wilderness education, and decolonization in Canadian arts institutions. She holds a BA in Art History from NSCAD University, and is the 2015 recipient of the Canadian Camping Association Research Award of Excellence for Notes on Camp: A Decolonizing Strategy.